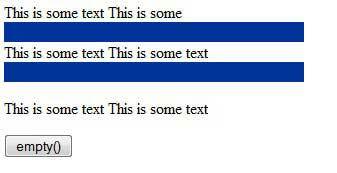 The empty() method is clear all element content and inside element content and :empty selector selects all empty element in document. The empty() is jquery method to remove all child nodes of the set of matched element and content from the selected element. The empty() method is dose not remove element it's remove only data from element. This method cannot pass any argument. :empty selector select all empty element in document. In empty element, there is no text or data.